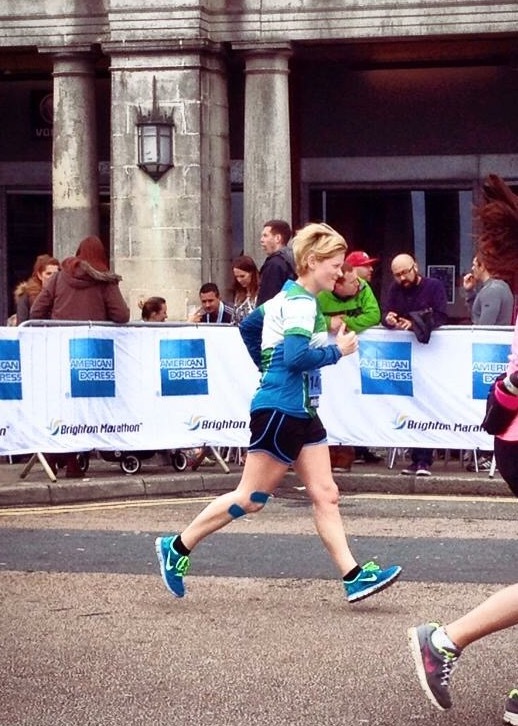 50 marathons before 50: Brighton Marathon 2014 - My first and last? On reflection, my first marathon still feels like a disaster! I have even been putting off writing about it for a while as it’s still tinged with negative feelings. However in writing about the last 4 marathons that I have completed, I have realised that I learnt a great deal from Brighton. At first even the thought of running a marathon sent shivers down my spine but I love a challenge and I wanted to raise funds for The Alzheimer's Society having recently found out that my dad's partner Linda had been diagnosed with early onset dementia. I purchased a guidebook on how to run a marathon in sub 4.30 hours and I devised a rough plan on how to make it work! I gradually got used to the long runs but I was miserable before, during and after! I had no one to run with and I hadn’t quite realised how hard it was going to be by myself. I ate badly with no regard to nutrition and didn’t include any cross training in my schedule. However I plodded on with the training and tried to fuel on the go with regular energy gels and soon enough the big day arrived. My friends and family had all made the trip down to Brighton and I felt as ready as I could and lined up with thousands of other runners at the start line. A quick hi-five from my running hero, Paula Radcliffe and I set off. I started surprisingly well and between mile 1-5 I was bang on target for pace and seemingly enjoying myself. However, I got carried away in the moment and was flying between mile 6-13 but I felt awesome…...I felt less awesome by mile 15! My feet had started to hurt ( I was wearing trainers that were only 1 week old and not been run in before!) and I was hungry, really hungry! I grabbed and glugged anything on offer so that I could refuel, jelly babies, gels, gatorade, lucozade but it was all too late! I ran/walked/staggered onto mile 18 and realised I had hit the wall! Struggling on after hitting the wall. The Great Wall of Brighton! I stopped completely at mile 18, I had come so far but couldn’t face the last 8.2 miles feeling so ill but I remembered why I was doing it and didn’t want to let Linda or my family down. My ITband was on fire but I had no idea what to do, and so I aimlessly taped myself up with some sub standard Kinesio tape! I limped and hobbled through the next 5 miles and became angry that my pace had dropped and every minute that passed meant I was losing sight of my 4.30 hours finish. At this point all I remember is everyone passing me, rhinos, storm troopers, a man in a diving suit and a man with a tiger on his back! They all whizzed passed unaffected by my state of mind and body, I felt broken and unable to complete my first and maybe even my last marathon. I called my girlfriend and cried at her! Luckily she was waiting to cheer me on at mile 23 and best of all she had my brother with her ( who may have been on the G & T’s). Caz could see straight away that I was struggling. I gave her my bum bag and my iPod and glugged more fizzy drinks and ate more sugar. She gave me a pep talk and my brother gave me a hug, it was then that Caz and my brother decided they would both run a mile with me! They were both fully clothed in heavy winter jackets and both had heavy bags, but they were totally committed to supporting me on my marathon quest and so we headed off together. I collected my medal and goodie bag. I felt that I had worked really hard for it, but my finish time was 5.47 hours which at the time I saw as a big disappointment, however I now see it as a foundation on which to build my challenge to complete 50 marathons before my 50th birthday. Thankfully my family and friends saw it as a great achievement which helped me enjoy the moment and as we chatted away on Brighton beach, the rest of my broken body seized up! Great support from my whole family. As time went by I realised that all the mistakes I had made were ones that I could learn from. If I ever ran another marathon again at least I would feel better equipped. Looking at fuel and hydration, I never use gels and always run with a hydration pack with SOS sachets to supply essential electrolytes and minerals. I also eat well and on the go but never again will I eat jelly babies, jelly beans or any other confectionery! I make my own energy balls from dates/almonds/coconut which my stomach has no objection to and I can fuel happily on these for hours. The way I train as altered as well, I only run 3 times a week when training for a marathon and use cross training on the other days, I also take a full rest day after my long run. Running with others is best for keeping my motivation up, so I now run all my long runs with friends, it’s an incredible feeling to have their support and often some random singing along the way! I found with niggles and injuries it is best to get help from experts immediately and I now have a great support team to consult with, as well as regular sports massages to help with my troublesome ITband. Now the dust has settled and I’ve put pen to paper, Brighton doesn’t seem that bad after all. 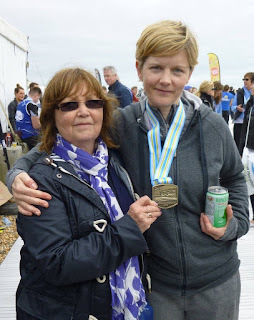 With everything I had been through on the day and the negative memories I had attached to it, I had forgotten that I had still completed my first marathon and raised over £3,500 for the Alzheimer's Society and for Linda. I had showed my family and friends what I was made off , they were proud of me and I had achieved something truly awesome! This girl is not made of sugar and spice and all things nice, this girl is made of grit, determination and an unfathomable amount of stubbornness!